Remote outposts face one set of energy problems; the interconnected US grid another entirely. Can microgrids be a solution for both? Power automation and technology company ABB believes they can. From its North Carolina offices, the Switzerland-based company is eyeing the lower 48 states after focusing its microgrid strategy on places like Kodiak, Alaska and Flores Island. “It’s an emerging market,” said Brad Luyster, ABB’s vice president and general manager for microgrids, in a recent interview. Indeed, Navigant Research describes North America as the global leader for microgrids with 66 percent, or 2,874 MW, of the planned, proposed or existing capacity worldwide. Just considering microgrids that are under development, North America holds 67 percent of market share, according to Navigant’s Microgrid Deployment Tracker for Q2 2014. ABB moved into the microgrid space in December 2011 with the purchase of Australian company PowerCorp, which offers flywheel and battery stabilization technologies and distributed controls. Its systems can be found in places like a nickel mine project in Australia and a research station in New Zealand. Remote locations often employ microgrid technology as a way to integrate renewable energy into diesel-dependent power systems. While wind and solar bring clean and inexpensive fuel, they also insert instability into the system. A cloud cover or a wind lapse can cause power fluctuations. ABB brings system stability by incorporating low- speed flywheels with solid state converters. In the US, the technology problems are different. High tech industries demand power quality that’s not always available through what ABB calls the US “embedded grid.” Further, because the US grid is large and interconnected, it can fail in grand ways with cascading damage that causes wide-scale power outages. Microgrids can separate or “island” from the macrogrid to protect critical facilities from that failure. “Adding solar and wind into the US grid isn’t a challenge; the challenge is doing it in a small community and then being able to island on and off the grid… in a seamless fashion so that the lights don’t blink or the power doesn’t go off for a few seconds,” Luyster said. The technology exists to make microgrid effective in the US. But politics stands in the way. Many utilities see microgrids as yet another form of distributed generation stealing away their customers. Would you like to read more energy efficiency and microgrid news? Subscribe to our free Energy Efficiency Markets newsletter. Luyster sees two key trends emerging that shape the future of microgrids in the US. The first trend encourages customers to leave the utility. Data centers would likely be the first to go, given their growing need for energy and power quality. The second trend encourages utilities to be the ones adopting microgrids, as a way to create grid redundancy and better handle storms and other events that cause grid failures. It’s unclear what trend will dominate. State and federal policy remains vague when it comes to microgrids. 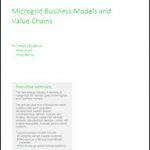 How rules emerge will likely determine the shape of the US microgrid industry. Development could occur unevenly throughout the US because of its existing market variances, according to Luyster. For example, in deregulated markets like the Northeast, utilities may not be allowed to own microgrids, so independent development companies may dominate the market. But in vertically integrated markets utilities may embrace microgrids, since they’d be allowed to develop and own them, Luyster said. What will be the tipping point for microgrid in the US? Utilities will take microgrid seriously when big industries abandon them to join or build a microgrid. Data centers are likely to be the first to go, he said. Are you interested microgrids? Join our new LinkedIn group, Microgrid Knowledge and add to the discussion.